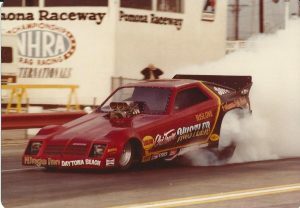 Nostalgia drag racing has experienced tremendous growth over the last several years and one of the most popular categories is Nostalgia Funny Car. With so many new teams and drivers entering this class, Frank Hawley’s Drag Racing School is now offering training specifically for aspiring Nostalgia Funny Car drivers. “We’ve offered training in both Alcohol Funny Cars and Dragsters for years,” said Hawley. “Many of today’s NHRA Pros trained at our TAFC program before entering the NHRA Nitro Funny Car class. Over the last few years we’ve also licensed several drivers in our alcohol cars that were headed to the Nostalgia class. There are however a few differences between driving a pedal clutch, 3-speed alcohol car and a centrifugal clutch car. So we have developed a program that will provide drivers with the exact same routine they will be using in the Nostalgia cars. The car is set up to drive like a Nostalgia car, complete with a Crower centrifugal clutch.” “I had a great time racing the Chi-Town Hustler with Austin Coil back in the 80s. Those cars were a blast to drive. And I even got a chance the past few years to get behind the wheel of the restored Chi-Town Hustler owned by Troy Martin. It’ll be a lot of fun to help drivers get up to speed to race in the Nostalgia Funny Car class. Also, the class will prepare and license drivers for any fast 125″ wheelbase car. There are many drivers that race these cars in an index class and this will be the perfect program to get them started in the right direction,” said Hawley. If you’d like more information on this or any other program, contact the school at 866-480-7223.